Organizers of an Irish dancing festival in Tel Aviv have made false allegations — reported uncritically by some media outlets — that they had to cancel the event because of “threats” from Palestine solidarity campaigners. The first Israeli feis — as the festival is known in Irish — was due to be held in Tel Aviv in mid-August, with calls for participants sent to Irish dancing groups worldwide. The festival was planned by the Carey Academy Israel, an Irish dancing school with branches in Israel and Russia. This disingenuous statement ignores how Palestinian fans of any kind of art are routinely “starved of their enjoyment” by Israeli military occupation and travel restrictions, and that cultural events are a major strand in Israel’s attempts to whitewash its abuses to international audiences. The claim to neutrality was also undermined by the heavy use of the Israeli flag and other Israeli imagery in the promotional material for the event. Palestinian solidarity activists launched a campaign, urging dancers not to sign up for the Tel Aviv festival under the hashtags #DontDanceForIsrael and #DontShameOurName. The Ireland Palestine Solidarity Campaign stressed that it did not call for the cancelation of the feis, but for performers not to travel to Israel or take part in it. A letter to An Coimisiún le Rincí Gaelacha (CLRG, the Irish dance commission) pointed out that many musicians and dancers had already taken an ethical stance by signing the Irish artists’ pledge to boycott Israel. These included the singers Damien Dempsey, Paul Brady and Frances Black and the musicians Sharon Shannon and Donal Lunny. The statement also noted that Robert Ballagh, an artist who designed the set for Riverdance, a commercially successful Irish dance show, had protested against Riverdance being performed in Israel during 2011. Ballagh donated his royalties from the performance to an Irish ship that attempted to break Israel’s maritime blockade of Gaza. 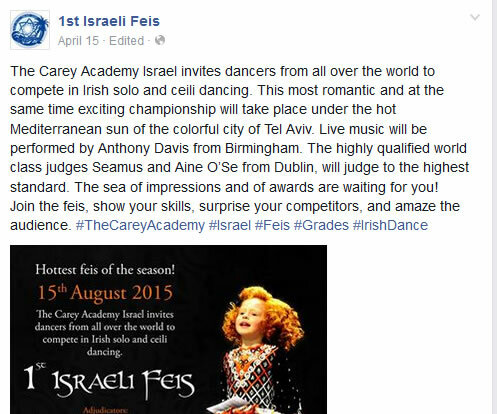 With the social media exposure eroding the organizers’ cheery image of the Tel Aviv feis, the Carey Academy’s tactics turned nasty. The academy’s 7 July announcement that it had had to cancel the festival included allegations of threats and threatening behavior by campaigners. A statement by the academy — which also included incorrect information about the Ireland Palestine Solidarity Campaign — tried to construct a spurious victimhood for participants. Without any examples or concrete facts, the message alleged that “parents and students” had received “threatening messages” and that the feis — an innocent “celebration of dancing, friendship and joy” — had turned into an event which “risked the safety” of the dancers involved. In a wearingly familiar display of uncriticial journalism, parts of the Israeli and Irish press swallowed the claims whole — never thinking to ask for evidence. Some articles also cited allegations that a demonstration outside the Carey Academy’s headquarters in the English city of Birmingham had been violent and intimidating, despite video footage of a small, peaceful protest in which those present maintained constant coordination with police observers. And a letter from the CLRG — the main focus of the IPSC campaign, which asked the commission to withdraw its endorsement from the festival — confirmed that it had not experienced threats or threatening behavior. The case was even raised in a committee of Ireland’s parliament, the Oireachtas. One senator angrily rejected the unsupported claims of threatening behavior. A more rigorous report by the website Mondoweiss noted, however, that special hotel deals offered by the Tel Aviv organizers to participants were still available days after they were supposed to have closed. It seems improbable that every dancer eligible to participate from across the world can have been “intimidated” into withdrawing. 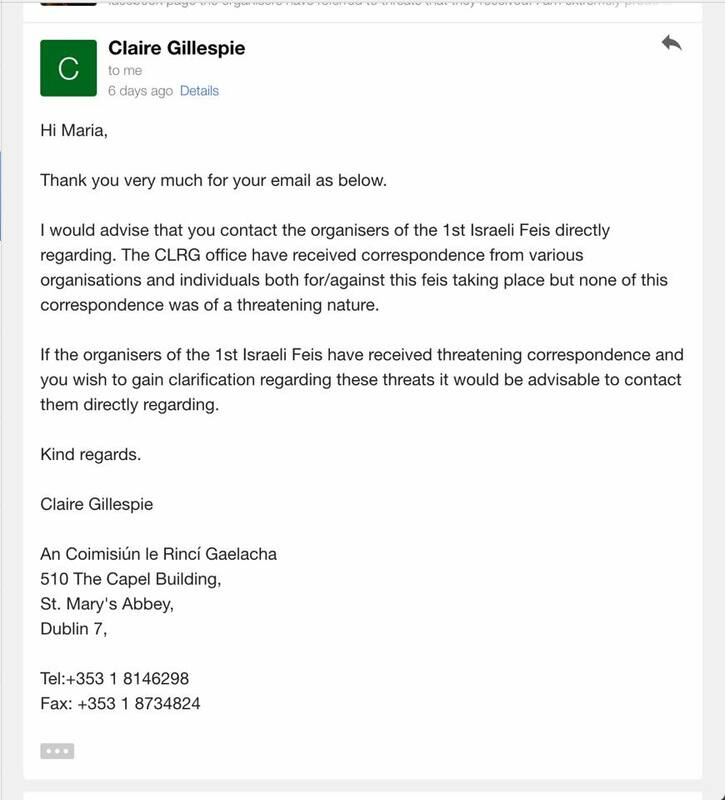 This raises the likelihood that disapproval of the feis from within the Irish dancing community may well have succeeded, showing organizers that their attempts to shackle Irish culture to Israeli propaganda were not going to work. There's very little interest in traditional Irish dance in Israel. Hassidic, yes. Not Irish. The two countries share little common ground in the cultural field. So the notion that Israelis were clamoring for the favor of this feis and are being deprived of a longed-for encounter is simply ridiculous. The whole thing was a propaganda exercise to break the boycott. And it flopped largely because nobody signed up to attend. The proposition was a money loser as well as a political misfire. As for the eagerness of the Irish media to take up the false narrative on this story, the state broadcaster RTE is a citadel of neoliberal, right wing "consensus" and much disparaged on that account. The private media are equally committed to a conservative viewpoint. For many years virtually every national and local newspaper- apart from the egregious "Irish" tabloids which are British owned- have been controlled by a single oligarch: first, Tony O'Reilly, a fierce opponent of workers' rights and international calls for justice for Palestine, and latterly by Denis O'Brien, the billionaire behind the privatisation scheme known as Irish Water. Reporters and editors working for such employers don't have to be told what to print. A quick scan of yesterday's paper gives them sufficient indication of what's expected today. Israel routinely gets its way through intimidation and threats. So, what's the problem? If the Irish dancers haven't the fortitude or the kindness of heart to not participate through their own human decency, then they got pushed to do the right thing. I see nothing wrong with fighting fire with fire, so to speak. Please now consider BDS for the Carey Institute. I know, I will never support them again. There are way too many ill informed and willfully ignorant #jsil supporters in Ireland. Well well...how convenient to exploit these innocent civilians to attain their bold face lies. If this statement is so True...then let them have their dance in Palestine/Gaza...where the real citizens of war crimes and atrocities have left them without homes, hospitals and shelters, without freedom, justice and the pursuit of happiness in family, in community and in their own land. Cursed are these liars and let BDS keep up the message that this must STOP. Far from seeking "to ease pain and suffering...etc." the Israeli feis was, in my opinion, a transparent attempt to undermine the considerable opposition to Israeli colonial/settler policy, which exists in Ireland, by emulating a key Irish cultural event. I believe this 'charm offensive', designed to flatter, was triggered by a recent Israeli government characterisation of Ireland is one of the 'most hostile' countries to zionist policy. The Israelis would do better to stop blowing the legs off children as their bombs do regularly in Gaza.